Does organic grass fed meat cook differently than the grocery store and factory farmed grain fed beef I'm used to cooking? Yes! Why? One, because it is free roaming, the animal uses its muscles more throughout its life which, as you might expect, creates a leaner and tougher muscle tissue.This also means organic grass fed meat is lower in fat and calories, too. Without added grain feed, the meat from grass fed animals has a completely different, and much healthier, nutritional profile than grain fed beef. They are also healthier because they are never given antibiotics, added hormones other growth promoting substances. 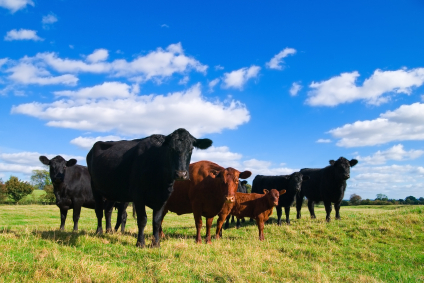 The land they graze is also certified organic and so the animals are never exposed to GMOs (genetically modified organisms), herbicides, fungicides, pesticides or chemical fertilizers. Two, because the animals are 100% grass fed (and organic) they do not receive any grains, ever. Grains add weight (fat) quickly and increases the intra-muscular fat known as "marbling". This marbling creates added tenderness but also has a less healthy nutritional profile with added calories. When you see packages at the store that say "organic meat" or "organic beef" that doesn't mean they never received grains - it just means that any grains fed the animals would be organic as well. The organic grass fed meat Topline Food sells is the best quality and most healthful product you can get! Before we get started, let us just say that cooking your organic ground beef is really not going to be any different. The grinding process is also a tenderizing process so the flvor and texture of your browned ground beef should remain very familiar. We would recommend, though, that when browning your ground meat that you use a slightly lower temperature to reduce the possiblity of drying it out. Also, if you use your ground beef to make burger patties, you may want to cook them over a slightly lower heat as well. 1. As we mentioned, grass fed meats can be a bit more tough. To tenderize your steaks, we recommend an overnight marinade in the refrigerator. Simply run the frozen steaks under some tepid water until you can move the vacuum sealed packaging a bit. Cut your steak packages open and place the meat in a plastic zip type bag. 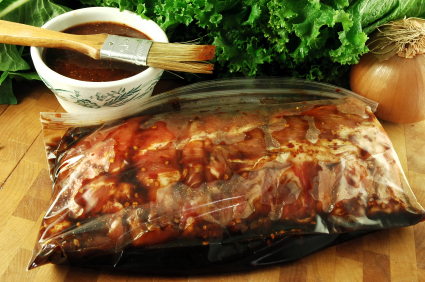 Then, add your marinade ingredients, squeeze out most of the air to ensure good marinade coverage for your steaks and place in the refrigerator overnight. As they thaw, they will also be enjoying the tenderizing effect and flavor enhancing benefits of the marinade. We have some great ideas for marinade flavor combinations here. 2. Another way to tenderize your meat is to apply a flavorful rub and allow to remain in the refrigerator for at least 2-8 hours. When you have become accustomed to and enjoy the different textures of grass fed meat, this method will increase flavor and tenderness but not as much as a marinade. Avoid rubs with a high salt content as this can actually draw moisture out of the meat. We recommend rubbing the steaks with a good quality oil and sprinkling with sea salt and freshly cracked black pepper immediately before grilling, broiling or searing. 3. Cook at a lower temperature and to a lesser level of doneness than you would a grain fed steak. We recommend rare to medium rare to ensure the steak is juicy and delicious. Also, be certain to let your meat rest for 5-10 minutes after removing from the heat to allow the internal juices to redistribute throughout the meat. If you cut into it right away, you will find all that good juiciness running out onto your cutting board - what a waste! While you are getting familiar with these new techniques a good quality instant read thermometer will come in handy and help you to avoid over cooking the meat. 4. All of your organic grass fed meats will be more tender and have an improved mouth feel when sliced thinly and across the grain of the meat. Cutting across the grain slices the longer strands of muscle into smaller portions that make it much easier to chew and therefore, much more tender. 5. When cooking a pot roast like our chuck or rump roasts, it is important to brown on all sides to get that caramelized yumminess into your finished dish. As with steaks, do the searing/browning at a bit lower of a temperature (medium high versus high) and for a longer time until you get the golden brown and delicious color you desire. Than, add to a pot or slow cooker with your favorite pot roast liquids and ingredients. Be sure to cook at an extremely low temperature until you reach the level of tenderness you prefer. It is important to never reach a rapid boil of the liquid when your meat is in the pot. Rapid boiling of meat will tighten and toughen the texture of the muscle and creates a rubbery result. A gentle simmer is what you are aiming for when slow cooking or braising meat. We find that most slow cooker recipes that say to set the machine for 8 hours on low end up with a bit too soft of a texture for our taste and we tend to prefer about 6 hours for a roast in the slow cooker. 6. The tri-rip roast we offer is a different type of roast altogether. It is actually best on the grill (not slow cooked or braised) after being marinated. It will be tender, juicy and delicious cooked over indirect heat for about 30-40 minutes. Again, an instant read thermometer will be very helpful in determining the correct level of doneness-we recommend no further than medium. We hope these cooking tips will ensure you enjoy not only the many health benefits but also the delicious flavor of your highest quality organic grass fed meat! Enjoy the convenience of shopping online with home delivery to save your time and money while enjoying the best quality meat! To your health!